Michael Parayno’s Friday night Birdland Jazz Club and Multi Culti Grill is returning tonight — but now as a private party. Held in Parayno’s birdhouse-decked garage at 1733 Sacramento Street, the Friday night barbecue has attracted a dedicated following, as well as the ire of Berkeley’s zoning officials. As of late last year, Parayno was facing a fine of at least $8,000 for holding a party without the proper permits. Parayno started holding neighborhood barbecues last summer, and gradually expanded the festivities to feature live jazz, as well as a rotating array of multicultural grill specialties. As a result, Parayno said tonight’s barbecue will be a private party, open only to people on his mailing list and their guests. 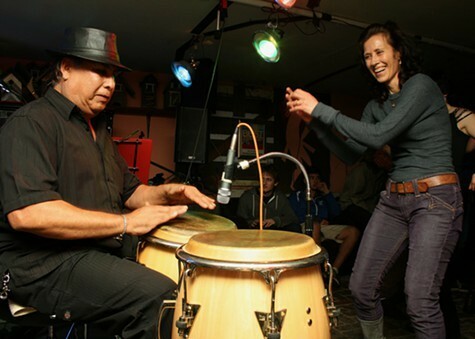 Up to now, the jazz-and-barbecue nights have been open to all, and have attracted a uniquely diverse cross-section of locals, from Parayno’s next-door neighbors to Berkeley High School jazz musicians, soccer moms, and international students. Parayno said that he is still in conversation with city officials, and that he is also in the process of obtaining amplified sound permits. He hopes to bring back the full community jazz nights in March and April, once his permitting issues have been sorted out. Tonight is only a “soft launch,” for those on the list. The Paul Lynch Quartet — featuring one of Parayno’s neighbors — will be performing starting at 8:30 p.m.